DID YOU KNOW THAT BOTH WINE AND CHOCOLATE ARE CONSIDERED APHRODISIACS? HERE ARE SOME HELPFUL PAIRING TIPS TO MAKE YOUR VALENTINE’S DAY EVEN SWEETER! WINE AND CHOCOLATE CAN BE DIFFICULT TO PAIR, BECAUSE BOTH CONTAIN TANNINS DERIVED FROM DIFFERENT SOURCES. 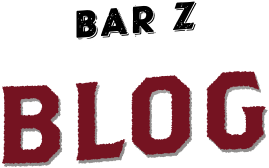 TANNINS ARE WHAT CAUSE THE “DRYNESS” WHEN YOU DRINK A WINE, OR THE “BITTER” SENSATION YOU MIGHT GET FROM DARK CHOCOLATE. THE TWO CAN COMPETE ON YOUR PALATE, CAUSING A LESS THAN PERFECT PAIRING. 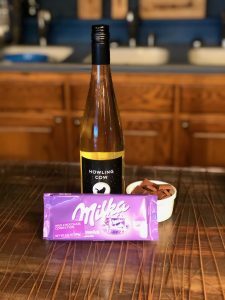 LET US HELP YOU DE-MYSTIFY CHOCOLATE AND WINE PAIRING FOR A ROMANTIC NIGHT IN, OR A FUN GALENTINE’S GET TOGETHER! DARK CHOCOLATE IS THE HARDEST TO PAIR, BECAUSE IT IS FULL OF POLYPHENOLS THAT CAN COMPETE WITH THE WINE YOU’RE TASTING, CAUSING A BITTER OR SOUR FLAVOR. (BONUS! 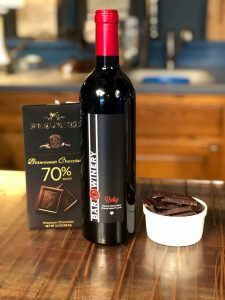 POLYPHENOLS ARE ALSO THE PART OF THE CHOCOLATE THAT PROVIDE HEALTH BENEFITS) DARK CHOCOLATES PAIR WELL WITH A PORT OR WITH A FULL-BODIED FRUITY WINE FULL OF INTENSITY. (LIKE A ZINFANDEL, MALBEC OR PETIT SIRAH) HERE AT BAR Z, WE’VE PAIRED IT WITH RUBY, A BOLD, INTENSE WINE FULL OF FRUIT AND CHARACTER. WHEN PAIRED TOGETHER, THE DARK CHOCOLATE BRINGS OUT THE FRUIT FLAVORS HIDING BEHIND THE BOLD TANNINS. LIKELY THE MOST SURPRISING PAIRING, NEXT WE’LL TAKE A LOOK AT WHITE CHOCOLATE. NO CACAO IS PRESENT IN WHITE CHOCOLATE, MAKING IT *TECHNICALLY* NOT A CHOCOLATE, BUT IT PAIRS REMARKABLY WELL WITH DRY RED WINES. THE WHITE CHOCOLATE ACTS AS THE FAT THAT DELIVERS THE FRUITY NOTES OF STRAWBERRY, RASPBERRY AND CHERRY, IN A MATCH MADE IN HEAVEN! 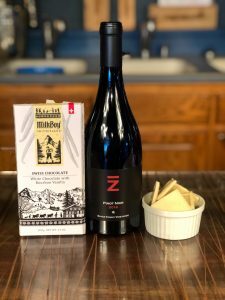 WE RECOMMEND A WHITE CHOCOLATE WITH OUR 2016 PINOT NOIR, BUT OTHER SUBSTITUTIONS INCLUDE A BEAUJOLAIS OR A GRENACHE. NOW WE’RE GOING TO LOOK AT THE MOST POPULAR CHOCOLATE, A MILK CHOCOLATE. TYPICALLY COMPRISED OF HALF CREAM AND HALF CHOCOLATE, THE EXTRA FAT AND SUGAR MAKE FOR THE SWEETEST OF PAIRINGS. WITH MILK CHOCOLATE, LOOK FOR A WINE THAT IS AS SWEET OR SWEETER THAN THE CHOCOLATE, SUCH AS A SWEET RED, MOSCATO, OR A PORT. HERE AT BAR Z, WE’RE PAIRING IT WITH HOWLING COW FOR A SWEET TREAT! THE SUGARS CANCEL EACH OTHER OUT, AND THE MILK CHOCOLATE BRINGS OUT THE OTHER NOTES IN THE WINE, SUCH AS PEAR AND MELON. BONUS! IF YOU’RE LOOKING FOR LOCALLY SOURCED CHOCOLATE TO MAKE YOUR VALENTINE’S DAY REALLY SWEET, WE RECOMMEND CREEK HOUSE HONEY FARM! 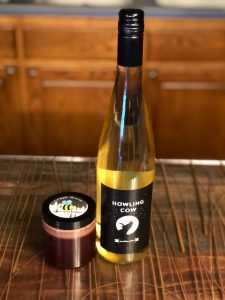 THEY MAKE A CHOCOLATE HONEY THAT IS SWEET AND DECADENT, AND PAIRS PERFECTLY WITH OUR HOWLING COW! SHOW THE TEXAS PANHANDLE SOME LOVE, AND PURCHASE ALL OF YOUR VALENTINE’S GOODIES LOCALLY!! ENJOY, AND IF YOU FIND ANY PAIRINGS YOU FALL IN LOVE WITH, LET US KNOW IN THE COMMENTS BELOW! HAPPY VALENTINE’S DAY TO ALL THE WINE LOVERS OUT THERE!